Celtic Technologies & Biogenie UK Ltd are exhibiting at the 2017 Ground Engineering Basement and Underground Structure’s Conference on October 5th. The conference which takes place at the Victoria Park Plaza in London on 4 – 5 October is one of the construction industry’s leading geotechnical events. It brings together the who’s who of the basements and geotechnical community to discuss where future investment opportunities lie and how the next generation of projects will be designed and delivered, as well as learning about techniques and technologies which will be critical to the delivery of future basement projects. As a company at the forefront of cost effective basement excavation & Soil management we just had to be there! 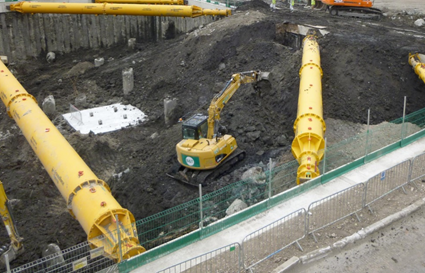 As one of the longest standing and most experienced specialist remediation contractors in the UK, Celtic-Englobe have direct experience of solving a wide range of contaminated soil problems, whether associated with complex contaminants, constrained site logistics or stakeholder issues. Celtic-EnGlobe is one of the leading soils management, remediation and Brownfield Enabling Works contractors In the UK, with a proven track record of delivery after more than 25 years in the industry. Celtic-EnGlobe is part of Englobe Corp, a world leader in providing integrated environmental services which operates in the UK, France, The Middle East, USA and Canada. By partnering with us, you are able to rely on our extensive experience and delivery capability. We listen and understand your needs, and by working closely together we help you overcome the challenges associated with Brownfield development. Celtic’s sister company, Biogenie-Englobe, is now the operator of the largest number of STFs in the UK. Our facilities, a joint venture with Biffa, provide national coverage for sustainable, fully compliant and landfill tax free, off-site treatment of a wide range of hazardous wastes and hydrocarbon contaminated soils containing asbestos. Celtic-Englobe continue to be a UK leader in the application of technologies, with current capabilities in over 35 remediation technologies including air sparging, multi-phase extraction (MPE) groundwater treatment, dewatering, in-situ and ex-situ stabilization, catalytic oxidation, bio-treatment and thermal treatment. Celtic’s sister company, Biogenie- Englobe, forms a partnership utilized by all our key clients. Biogenie- Englobe is a specialist in the off-site treatment of contaminated soils and sludges at our network of treatment facilities UK-wide. We provide complete waste treatment services to a wide range of customers in construction, development, municipal and industrial sectors. Watch the time lapse video of the Westmill STF pad construction! Beat the landfill tax increase – our facilities are landfill tax free and fully compliant!